Our expert instructors will guide you through step-by-step, from the academic session, extra time in the pool, as well as extra ocean dives. When you earn your certification with us, you'll be a safe, competent diver, one who will have the personal dives skills to help protect the envirornment and enjoy the underwater world safely. For your convienince, you have the option to study on your computer or on your iPad or Andriod Tablet - your choice! On Day 1 of class, we'll review your homework, go though an equipment session & get you outfitted in a top of the line rental gear package. Day 2: You'll learn and master all of the required fundamental skills on your journey to becoming a certified diver. . These confined water pool sessions take place under the supervision of our expert Instructors. The final step is to complete the required 4 open-water training dives under the direct supervision of your Instructor. Here you will apply what you have learned during your academic and skill-development sessions, while learning practical lessons that can only be gained through real-world experience in open water. ~ Join one of our Groups or bring your friends. There Are Two Ways To Get Started! CONGRATULATIONS - You're on your way to becoming a Certified Diver! 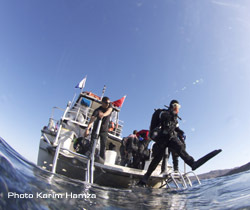 L.A. SCUBA DIVING is LA's Leader in GUE & PADI Dive Training. You simply won't find this level of training anywhere else in Los Angeles. Learn to dive with us - you'll be very pleased with your choice. Call us & see how easy it is to get started.